Following on from two triumphant all-dayers, When In Manchester festival geared up for a hat-trick with their third installment, Getintothis’ Jake Marley went along for the ride. When In Manchester is fast becoming a highlight on the north west cultural calendar. Organisers still well and truly have their fingers on the pulse of new music. Unearthing and showcasing new talent, supporting independent venues and bringing waves of like-minded folk together for a very memorable event. They’ve done very well not to budge from this ethos thus far and their unwavering vision to support new music is winning them legions of fans. The task facing organisers now however is as challenging as ever – how do you keep on bettering this year on year? This year’s third instalment, following on from previous all-dayers headlined by Trampolene, Cupids, The Amazons and INHEAVEN, proved that’s a challenge When In Manchester relishes. One key evolution was the move to a four venue split across the day – with Gullivers and The Castle kicking things off through the afternoon before stages at Jimmy’s and Night & Day Café hosted by collaborators Flying Vinyl and Bluedot Festival added to the fun well into the evening. Another great addition came in the form of the new for this instalment, When In Manchester app. Featuring a simple to use layout with easy to find stage times and venue details, helping the day run more smoothly. One thing the four venue format did bring however was clashes. When In Manchester picked such a storming lineup that it was nigh on impossible to catch everyone. That said, we had a bloody good go. Things warmed up nicely early doors with sharp Leeds outfit The Strawberries, playing earlier than you might expect due to juggling two festival sets miles and hours apart. The tight and extremely intimate space of The Castle was absolutely rammed for their set that included the ever glorious Laburnum House and what’s surely a future single – She Rhymes. An early highlight. A quick dash back to Gullivers was rewarded by a fantastic set from BERRIES. 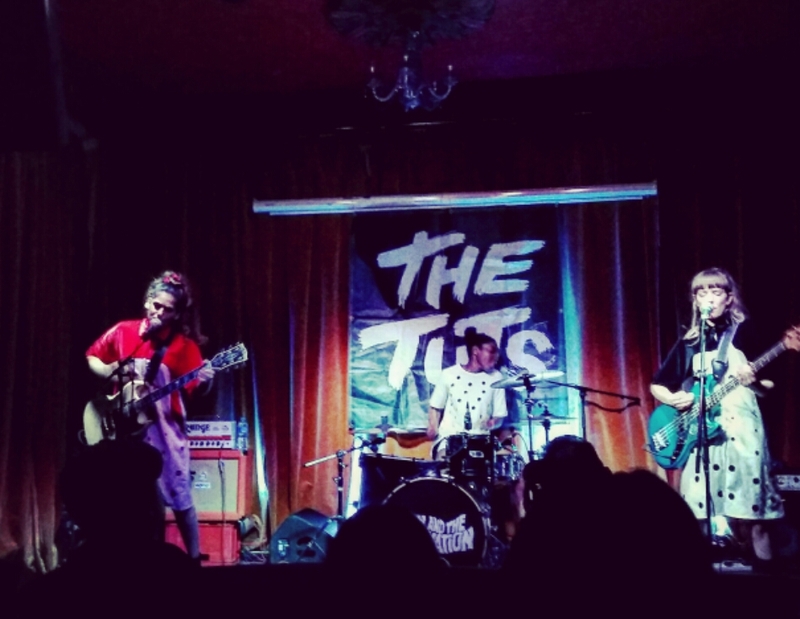 The trio were making their debut Manchester gig and their superb EP Those Funny Things and in particular, highly infectious, jaunty alt-rock slice Siren made them a must for the schedule. They didn’t disappoint. Another debut followed, a debut gig as a solo artist for Lucie Barât – whose surname needs no introduction. Backed by a tight band, Barât rocks live, there’s a real aura about her on stage, her lyrical delivery often strikes the perfect punk poetry balance between rocking vocalist and poetic wordsmith and the tracks, although all totally new to us, are either belters or real growers. Debut single Be Uprising is due May 8 – one to keep a very close eye on. Next back off to The Castle to check out Scots The Ninth Wave, off the recommendation of Anteros guitarist Jackson Couzens. Catching the back end of their set, their appeal is there for all to see. They’re tight, a beautiful blend of synthy undertones and glam-rock with the phenomenal dual gender vocals and harmonies of stylishly stripe-clad Elina Lin and lipstick-adorned Haydn Park taking them up another notch. Closer Reformation is superb and even brought out a few dance moves down the front. Wondrous. Now for a competitively billed and hugely clashing closing sequence. A trip to Night & Day to see White Room was next on the agenda whilst Guildford gems FØXE played to a hefty crowd in The Castle. White Room are positioning themselves as one of the finest emerging live outfits in the country – a tag that on this viewing they can certainly backup. Equally psych-rock vibey as 60s groovy. This is a quintet going places. Head down to FestEvol Gardens for another taste April 30. Seeing all three headliners was nigh on impossible unless you saw 10 minutes of each. 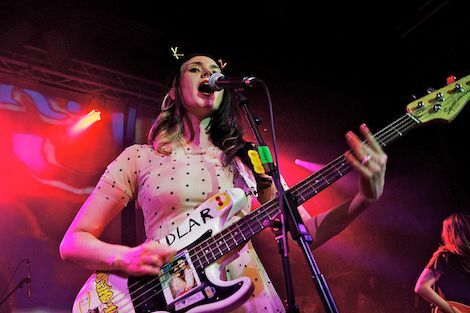 Kashmere and Jordan Allen both boasted significant crowds in The Castle and Night & Day, whilst utterly fabulous pop-punk trio The Tuts had an intimate crowd of adoring fans at Gullivers. Decision time then, and on a day that girl power had very much reigned supreme, it was decided to be only fitting that The Tuts be the closing memory. Right from the get go that decision was vindicated, as The Tuts ripped through their catchy set. Crowd interaction is very much a crucial part of their live show throughout – as trio Nadia, Beverley and Harriet encourage fans to dance, sing-a-long and join the fun. The intimate setting and cosy huddle of adoring fans in attendance dually obliged, dancing away, before guitarist Nadia and bassist Harriet ventured into the crowd for a further sing-a-long. The encore of their epic version of Spice Girls anthem Wannabe was utterly fabulous, as members and fans screamed the lyrics at each other till they bounced off the walls. Special. When In Manchester IV anyone?